Mdm. Low Oo Hwa had suffered a leg fracture which reduced her mobility. Concerned for her safety, her family registered her for the maintenance day care and community rehabilitation at St. Andrew’s Senior Care (SASC) (Queenstown) in November 2017. Three months down the road, Mdm. Low showed tremendous improvement in her endurance and standing balance and regained her ability to walk independently without a walking aid. While this is good news for Mdm. Low and her family, Mdm. Low missed the day care activities and her friends in SASC (Queenstown) as she is no longer required to attend day care sessions and her rehabilitation sessions have been reduced. She is now a volunteer with SASC (Queenstown), befriending the clients and assisting them in activities. Mdm. 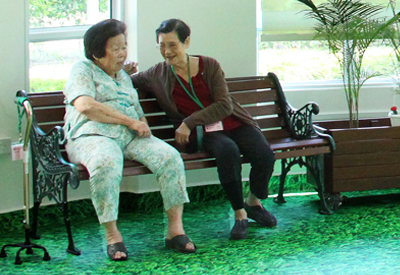 Low Oo Hwa (right) befriending a client at SASC (Queenstown).